The tile saw is a great invention. They are heavy-duty machines, easy to use, and highly effective in cutting tiles of all types, even at angled cuts. But, how do you go about buying the correct tile saw for your needs? Do you need a water pump or water tray? To help you decide, we have spent hours putting together the best tile saw reviews and listed down the top six best tile saws currently on the market. This will help narrow down your search. If you’re a little confused, take a look at our buying guide for some helpful tips. 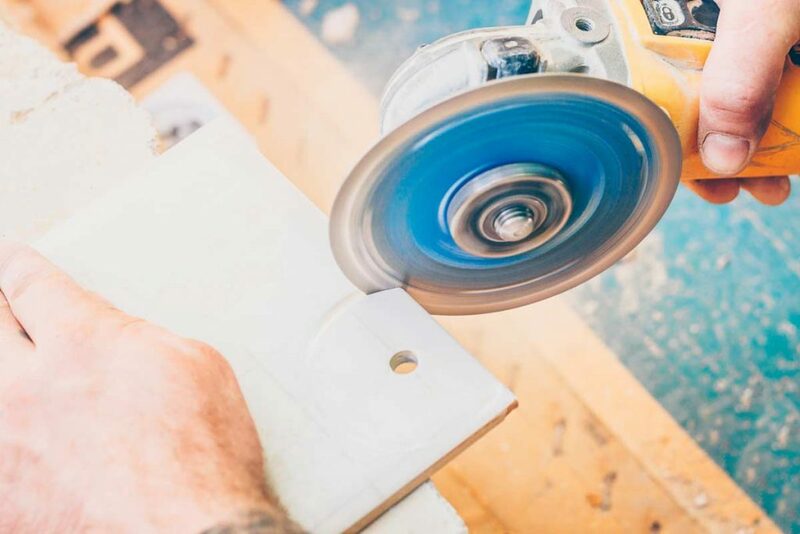 This article is aimed at all carpenters and masons, but the DIY homeowner will appreciate getting the best tile saw for their job. Tile saws are different from other saw types in that you feed them product a little more slowly. Be careful not to force the saw to lug too much as it can destroy the bearings and leave you frustrated. If you’re looking for a high-quality tile saw setup for your job site, then the Dewalt D24000S will serve you the best. The entire setup weighs 69 lbs., which allows even a single person to easily setup and transport. 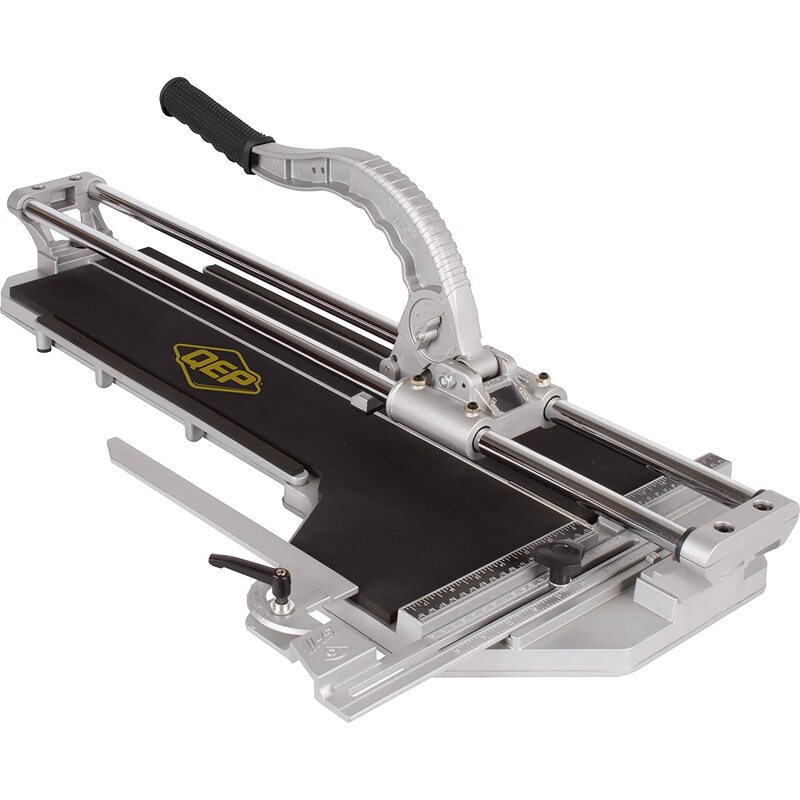 To help you make the most accurate cuts, the tile saw frame integrates the stainless steel rail system. In fact, the cut line indicator makes it easier to make precise cuts, granting you with a cutting accuracy of about 1/32 inch. 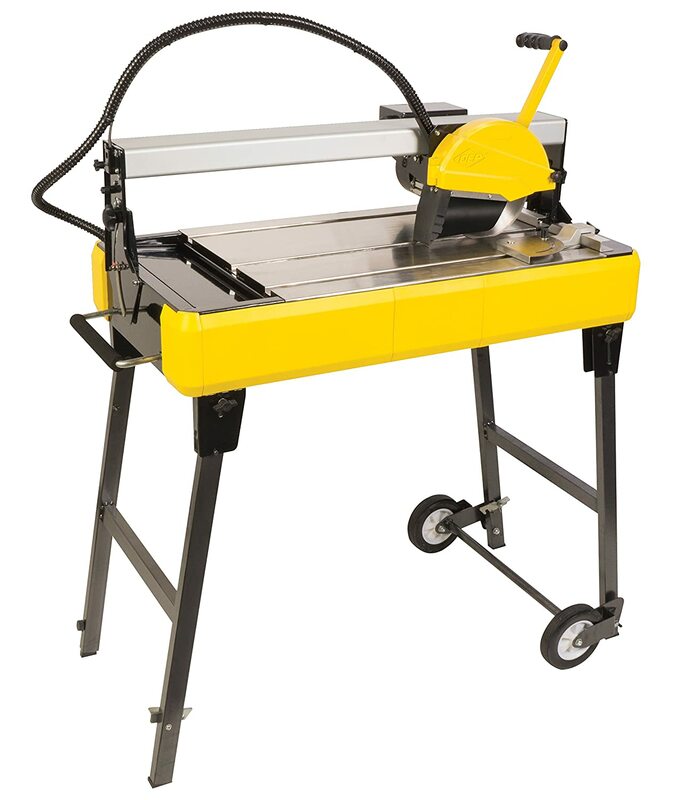 Furthermore,it has a rip cut cutting 25–28-inch capacity with a plunge as well as a diagonal cutting capacity of 18”x18” tiles. It doesn’t have a protractor, but it does have a 90-degree and 45-degree gauge. One notable feature of the Dewalt D24000S that we loved is the plunge feature. This allows you to make the quickest plunge cuts for all kinds of AC or electrical outlets. What’s more, there are water attachments on the rear and the side. This helps catch over spray and keep the water within the pan. As you would expect, it comes with a recirculating water pump. Unlike many of the competitor models, this pump doesn’t seem to struggle. Even better, it has easily adjustable dual nozzles to create optimal water placement. The included stand makes it easier for you work. Moreover, the stand is foldable which makes it easy to transport and store. Furthermore, the machine is quite easy to clean as it features a removable cutting cart. This saw comes with a diamond tipped blade. The QEP Black Widow blade is one of my favorites, and I’d recommend trying it out. If you use thick blades, then the table might not be able to accommodate you since it does not have the clearance to support them. But for standard blades, it will work just fine. 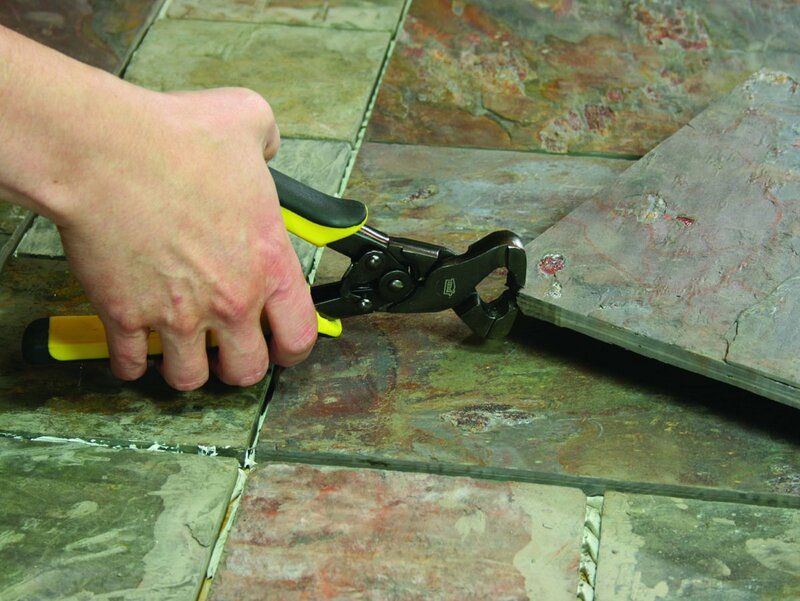 you’ll have no problem cutting bricks and tile pavers, making this saw more versatile. If you are only doing tile occaisionally, it is tempting to want to skimp on the price and go with a cheaper option. In my opinion, that just leads to more headache and wasted product due to inaccurate cuts. If you just need a saw for one task, there is nothing wrong with renting one. However, if you are looking to purchase a saw, then I’d invest enough to get one that is going to hold up, cut efficiently, and provide reliable cuts. All in all, the DeWalt D24000S is a reliable machine that makes the most accurate cuts. It might be perfect for professionals or DIY users. If you’re willing to let go of the stand for a more affordable option, then the MK-370EXP might be the perfect fit for you. The tile saw is 7 inches in length and weighs about 33 lbs. Thus, the tile saw is quite lightweight and portable. The saw is made to withstand the highest professional specifications to ensure a longer life. The 1.25 HP motor provides the ultimate power to the saw for precise and accurate cuts. The saw has a longitudinal cutting capacity of 18 inches and a diagonal capacity of 13 inches, which is similar to other heavier saws. Furthermore, the machine comes with a hinged blade guard which helps to keep you safe from any unwarranted cuts. Also, we found that it makes it easier to change the blade and maintain it. The machine is equipped with a 45-degree Miter system to help you get the most accurate cuts at all kinds of angles. What’s more, the machine even comes with a chrome plated linear guide. This helps provide support to you for easier and more accurate cuts. The plunge cut capabilities of the blade make cutting outlets or other electrical openings easier. One major drawback of the saw is the pump. We found that the pump starts off strong and then fades. However, the problem can be easily tackled by keeping the pump and the blade at the same level. 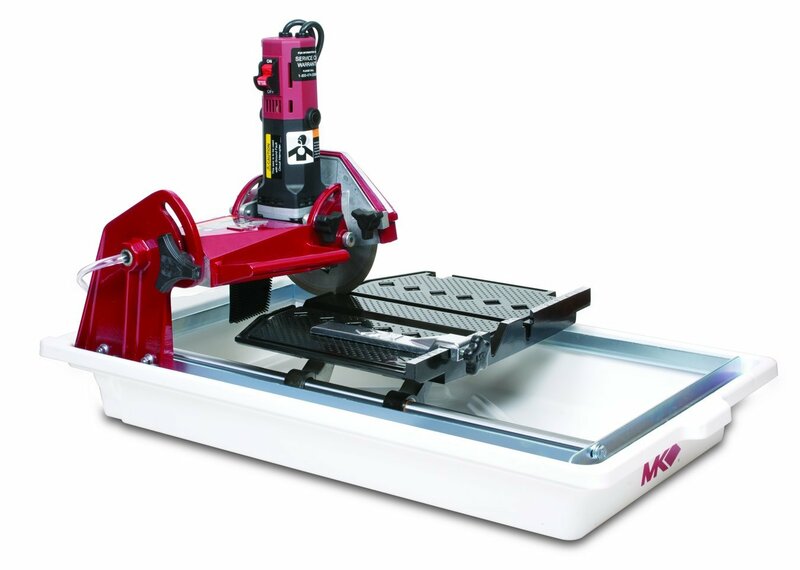 Mk Diamond offers a saw that matches the capabilities of some of the biggest brand names. This one is a top contender for those shoppers who want something different yet reliable. Conclusion: The MK 370 EXP is highly recommended for DIYers and even professional remodelers who want an accurate cut each time. Jam-packed with features, the QEP 83200Q is perhaps the highest quality saw at the most affordable price. It is equipped with a 0.5HP brushless motor which makes it ideal for cutting all kinds of stones and tiles. The cutting assembly consists of six ball bearings which make it easier to glide through the tile like a hot knife through butter. We also noticed that it minimized the vibrations significantly. Furthermore, the dual water nozzles ensures an even distribution of water to help protect the high-quality diamond blade. The rip cut capacity is up to 24 inches while it can do diagonal cuts up to 18 inches. The angle guide, as well as the adjustable rail, makes it easier to position the blade for the most precise cuts. In fact, we can easily say that the QEP is all about accuracy. Also included is a laser cutting guide to help you set an accurate cutting path. What’s more, the TOP system helps prevent the tile as well as the blade from overheating. The foldable stand comes with wheels which makes it easier to transport and store. The wheels aren’t the best quality, so you’ll find yourself moving it as little as possible. For those DIYers who worry about their kids or pets, the tile saw is childproof. Moreover, the power cords are packed in a protective tube to help keep everyone safe. The biggest complaint is that this saw needs to be properly aligned once you get it from the factory. It is typically 1/8-inch to 1/4-inch out of true, and you’ll need to adjust the bridge to get it back into alignment. 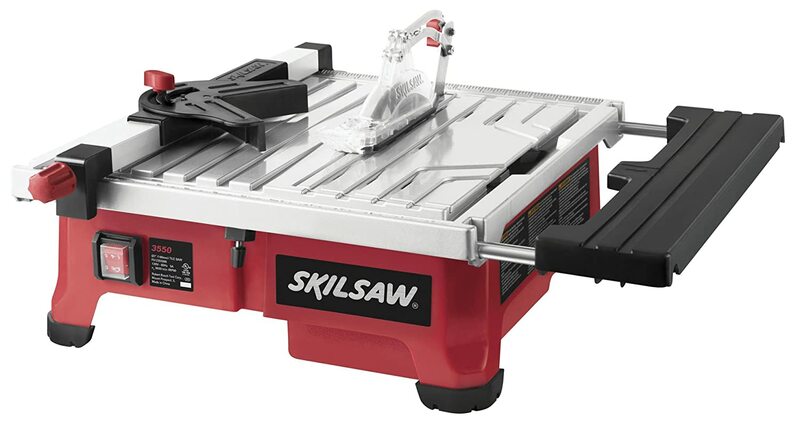 However, it is one of the only affordable bridge saws on the market, and if you want the flexibility of doing large 20×20 pieces, you’ll appreciate the value of this saw. Very heavyweight at 106 lbs. 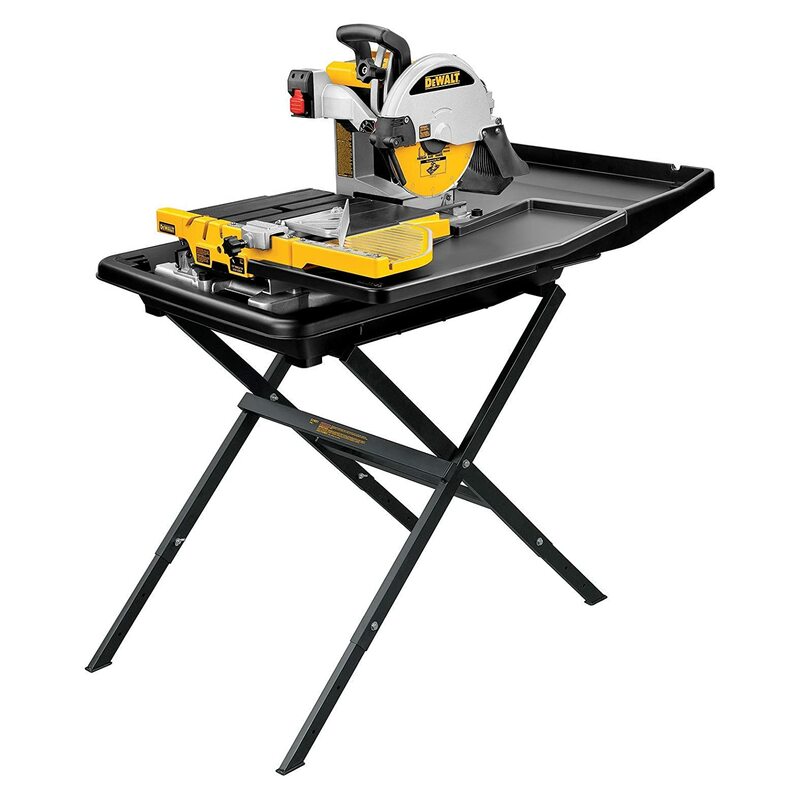 Much more affordable than the Dewalt series and equipped with a high-power motor, the Chicago 10-inch industrial saw stands head and shoulders above the competition. 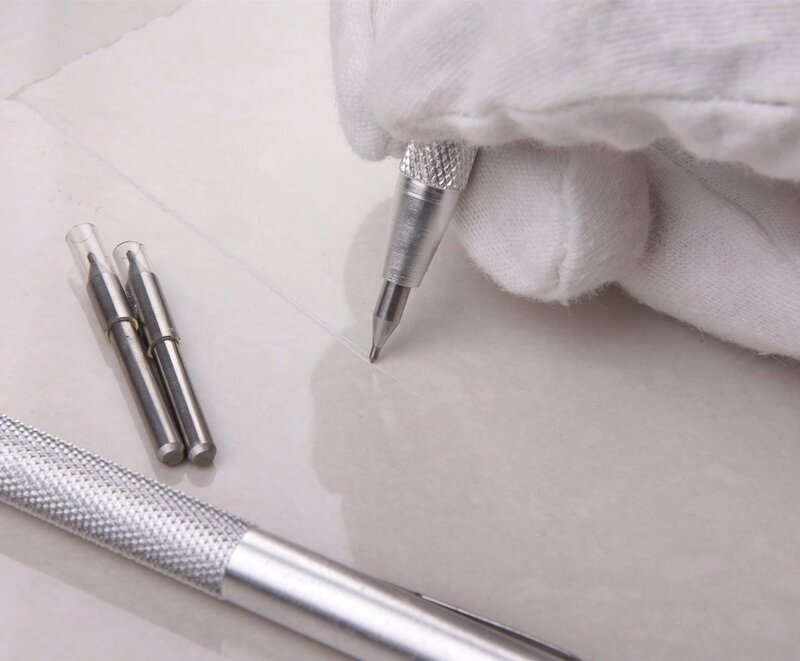 The 15 amp and 2.5 HP supply ensure the cleanest of cuts on the most delicate tiles. The sealed bearings helps it last longer even when working around water. It comes with an adjustable cutting head whereby you can easily adjust the blade to help you make up to 3.5 inches deep cuts. Furthermore, the rip cut cutting capacity of the tile saw is up to 24 inches. On the other hand, if you’re looking to make 0, 22.5, or 45-degree bevel cuts, you can easily pivot the head to your required angle. The powerful motor comes with ball bearings to make the operation much smoother. Moreover, the saw includes thermal overload protection which prevents the blade and the tile from overheating too much. If you’re worried about excessive vibrations, you can rest assured that the heavy-duty cast alloy cutting head ensures minimal vibrations. It runs on a steel frame which creates accurate and smooth linear cuts. The water pump gets some flack from users. It seems to work quite well if you have only pump run off a clean water source, and run the use water off into a separate bucket. Most people recirculate their water, and the pump may have problems with the “dirty” water. This is a Harbor Freight line of products, so little adjustments like this are to be expected. What we did find regrettable with this machine was the overspray. Although there isn’t much in the beginning, however, if you use it for long, there is bound to be a flood of water on the floor. Furthermore, we found that the instruction manual was a little unclear. However, if you’re already familiar with tile saws, then it shouldn’t be too difficult. Conclusion: All in all, the Chicago Tile Saw is quite suitable for DIY users and hobbyists who need something extra in their tool shed. The SKIL 3550-02 is perhaps one of the most lightweight tile saws on the market. However, the performance of the machine is quite like any other heavy tile saw. It is very portable and easy to store due to the compact design and the light weight. Don’t expect the same performance and cutting speed out of it that you would the Dewalt. But for the homeowner who is working on their house, it is an excellent investment. But, that’s not all! We loved the unique features on the machine such as the Hydro Lock System. This water reservoir helps keep the water near the blade to help lubricate it better without the messy overspray that the pump systems have to contend with. Ultimately, this results in lesser clean up time and sharper cuts. Moreover, it protects the tile as well as the blade from heating up too much. The stainless steel top helps resist corrosion. If that wasn’t enough, the sliding side extension helps provide a ton of support for tiles up to 18 inches in length. This extension table makes it easier to cut and results in accurate, smooth sawing. The table at the top is as durable as it is lightweight. It consists of aluminum, resulting in a rust-resistant surface. If you are working with larger tiles such as 24″ tiles, you might want to go with a different saw that more capable of those larger sizes. The miter gauge, as well as the adjustable rip fence, ensure better straight and miter cuts. To give you more flexibility in the types of cuts, the SKIL allows you to make bevel cuts at 0, 22.5, and 45 degrees. What we disliked about the saw was that the pan was not removable. This made it harder to dump the water out and clean the pan. However, the problem can be easily solved by using a removable pan on top of the supplied one. The SKIL 3550-02 makes for the perfect supplementary saw for professionals while for amateurs the saw may be the best deal on the market! As one of the pioneers when it comes to power tools, who can ever forget about the reliable saws from Porter Cable? Their PCC780LA Wet Tile Saw is perhaps the best saw on the market when it comes to high-quality build. We consider this the perfect saw for use in a home or a garage. Why? Because it is cordless! 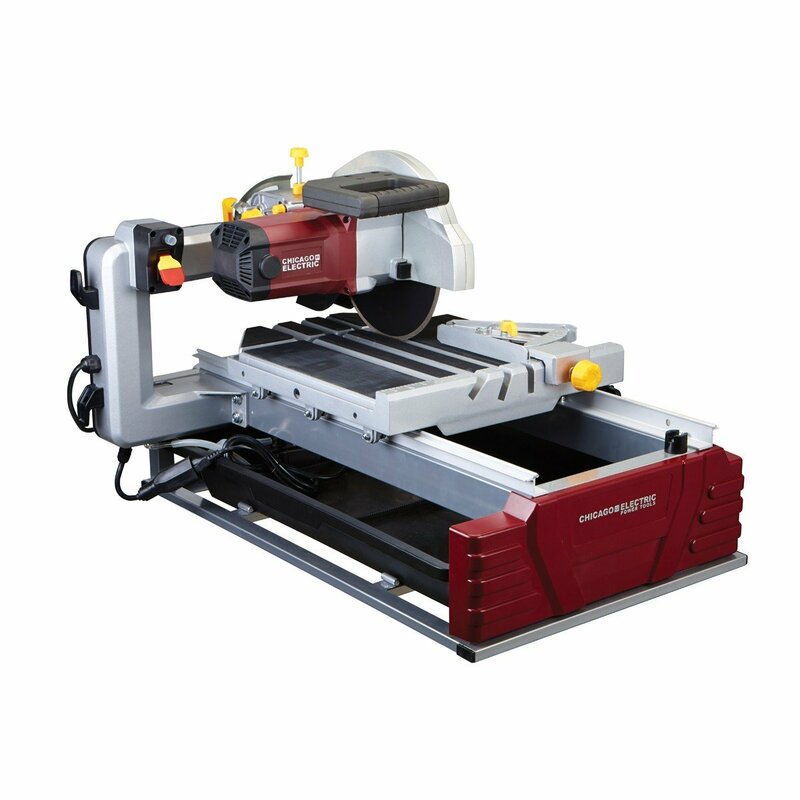 It uses a 20V battery pack to help deliver accurate and consistent cutting performance. The cordless design allows for better maneuverability since you can set this up anywhere you like without worrying about the power outlet. Moreover, it comes with a roll cage that makes it easy to carry and transport. To allow for easier and quicker cleanups, the Porter Cable saw comes with a water guard. This prevents the water away from the operator. Also included is a water container which helps contain all the water rather than letting it flood the ground. The battery indicator alerts you immediately if the battery is too low. Furthermore, an onboard miter square helps to line up all kinds of cuts for precision. Of course, you might want to buy additional batteries to ensure that they never run out which could include added costs. Plus, we felt like it did not cut as fast as an electric saw. However, looking at the high maneuverability, the con feels quite small. 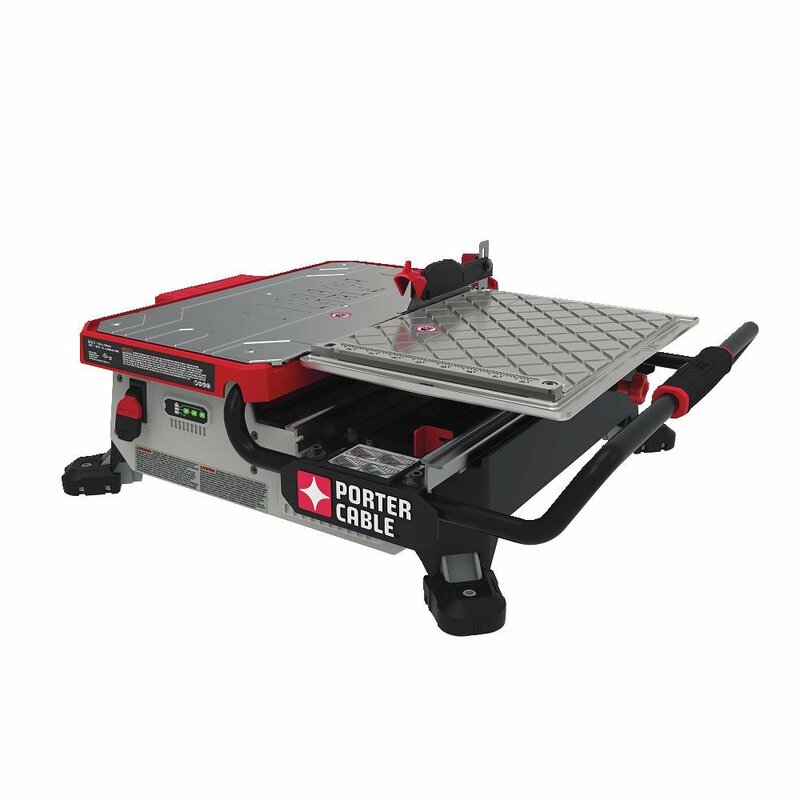 We highly recommend the Porter Cable Wet Tile Saw for those looking for a saw they can use anywhere, even outdoors! Before picking a tile saw for yourself, you must first know what a tile saw is. Most tiles are thick, brittle, and fragile, and so something like a table saw would immediately shatter them. In theory, you could use a chop saw or a miter saw outfitted with a diamond blade to cut smaller pieces of tile. But these saws aren’t ideal for bigger tasks. So, you need a durable and reliable saw that can help you cut precisely and smoothly without any damage to the blade or the tiles. This is where the tile saw comes in! It is a machine that is used to cut tiles, ceramics, stone, bricks, porcelain and so on. The features differ from product to product. However, the most basic feature involves a spray of water on the blade to prevent it from overheating. This is also why you’ll notice most individuals refer to them as wet tile saws. The water prevents the tile from overheating and cracking as well. Moreover, it captures all the flowing dust to help keep the area clean. 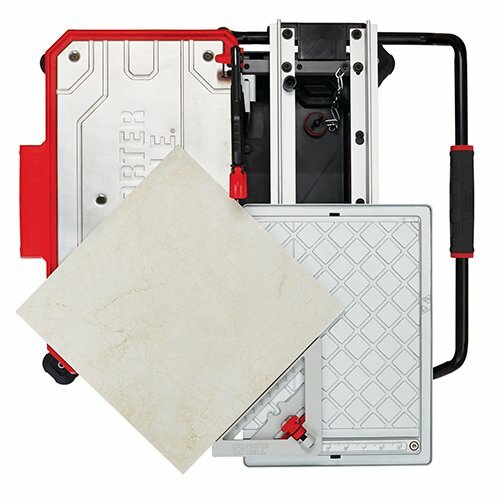 What Type of Tile Requires a Wet Tile Saw? There are no specific types of tiles that a wet tile saw can cut. In fact, wet tile saws can tackle almost all kinds of tiles as well as a couple of other materials with ease. In fact, you can do so easily using a rail cutter or other instruments. The main purpose of using a wet tile saw is not to cut specific types of tiles, instead, it is to ensure the tile does not get damaged and also to reduce the rubble or mess. 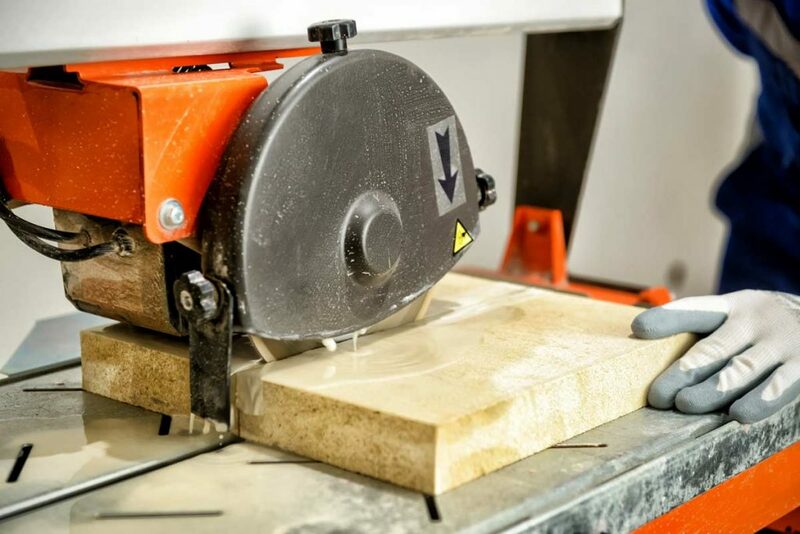 Usually, granite, stone, and ceramic tiles are most commonly cut using a wet tile saw. The general rule of thumb with tile saws is the higher the horsepower the higher will be the RPM. This is why it is crucial that you know the horsepower of the motor used in the tile saw. Of course, it does not mean that you should just pick the highest HP saw and call it a day. There are various other factors you need to take into account. If you’re familiar with other saws, then you might already know what a bevel capacity is. It helps to cut the tile in an angular shape by tilting the table. This will land more precise angular cuts. Most tile saws come with a bevel capacity of 0–45 degrees. We recommend you look for this ideal range. The cut length or the cutting capacity of the tile saw is how long the saw blade can cut longitudinally as well as diagonally. Usually, you will require a cutting capacity of rip cuts of up to 24 inches and a diagonal capacity of up to 18 inches. 10-inch blades: for tiles up to 3 inches thick. There are a few different types of wet saw blades, and you’ll want to get the right one for the task. Continuous Rim Blades: these are some of the most common tile cutting blades used on wet saws. The continuous rim transfers the water evenly, creating a smooth, cool, clean cutting surface that delivers some of the best cuts. This blade cuts more slowly than some of the other options, but offers the cleanest cuts and is suitable for slate, granite, marble, porcelain and other high-end materials. Turbo Rim Blades: These blades have a small air gaps that allows air to move through the blade and helps to keep it cool. These blades can be used for either wet or dry cutting and are suitable for concrete, bricks and masonry cutting. Segmented Rim Blades: These blades have holes in them to further help with the cooling and are designed for predominately dry cutting use. 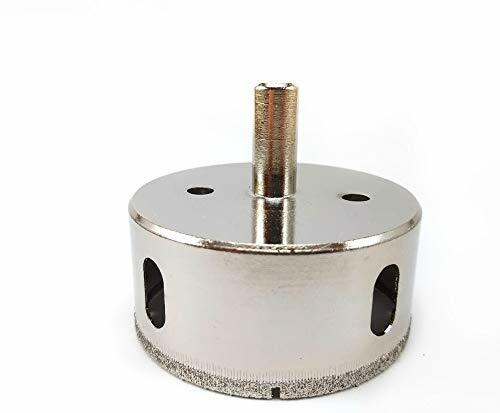 They are also used for brick and concrete cutting.Sometimes homeowners will use a segmented rim diamond blade on their miter saw for small tile or masonry jobs. The overload protection is yet another important feature to look out for. This feature prevents your saw and your tiles from overheating. Moreover, the motor will be protected from overuse or overload. Tile saws come in a variety of price ranges. The lowest range is between $200 and $300. Tile saws of $400 and even up to $1000 seem to be the most reliable. These mainly differ based on their quality, insurance, type, and overall performance. We’d recommend going for the $400 option. Determine the Type of Tile You Can Use It for and How Often It Will Be Used. The type of tile you’ll use comes into play here as well. Determine the type of tile you’ll be using and how often you’ll use it. Then buy a tile saw optimized for that. You’ll need to look up the type of tile you generally use.. Finding tile saws for your specific type might be harder. This means all the tech support and warranties you’ll get from the manufacturers. The most we’ve seen is a two-to three-year warranty, although some may offer a lifetime of support. Return periods of a few months are good, too. The overhead motor wet tile saw consists of a stationary blade where the tile is brought to the blade. However, this saw does not require you to push the tile towards it. Instead, it has a rail system which brings the tile to the saw and cuts it. 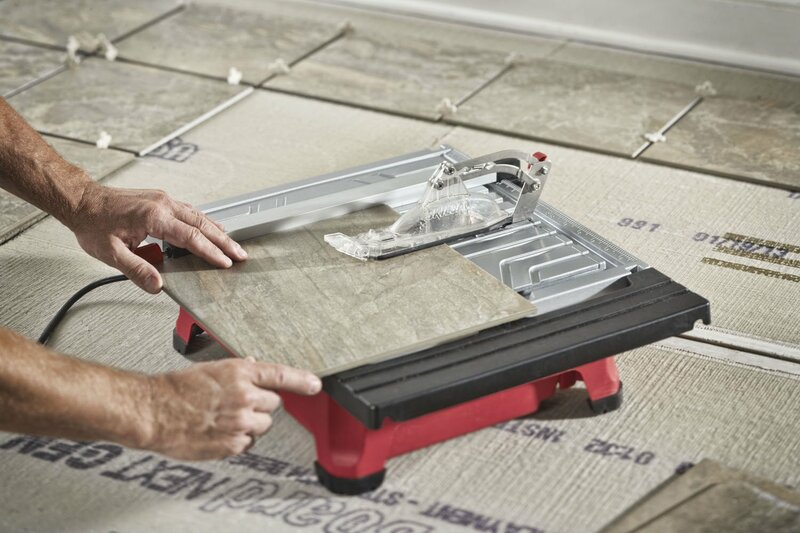 The rail system helps provide more support to the tile to enable precise cuts. They are quite expensive. 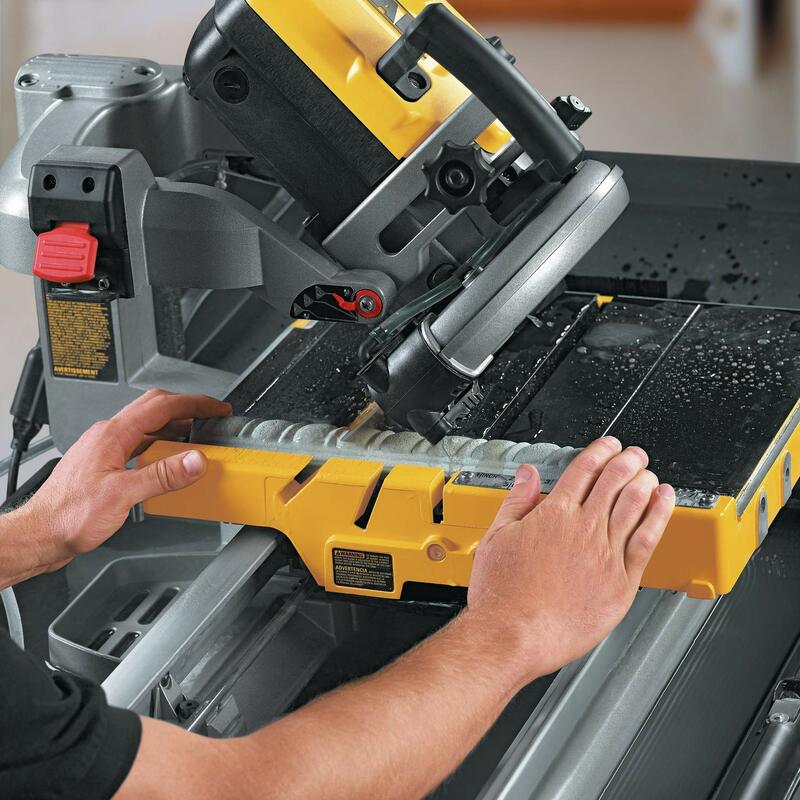 A tabletop wet tile saw consists of a table on which a blade is fixed. Then, it’s up to you to slide the tile to cut it. This is also a wet saw which means it uses a water system to keep the dust at bay. However, since you might be required to push the tile, it can affect the accuracy. Handheld Wet Tile Saws are perfect for making small touch-ups or small cuts. They are quite strong and you use them by bringing them down on the tile. Furthermore, they can be used as a dry saw, as well; however, it might make things messy. They are lightweight and portable. These are the simplest tools and are mostly used in DIY projects. They are manually operated and usually used to make small cuts. You basically place the tile on the saw and drag the scoring wheel across it. After scoring, you can put the assembly against your marks and snap the tile in half. A good quality score and snap tool can easily run close to the price of a cheaper tile saw. These score and snap tools can be good for large-format tile that don’t fit on smaller tile saws. Tile Nipper is quite like the score and snap clippers; however, they don’t come with the scoring wheel. They are shaped like pliers and can be used to cut smaller and thinner tiles. and are good for nipping at the edge of tile to make tiny adjustments. In case, you merely need to make a few straight cuts, the carbide pencil is the best and most affordable way to do so. You simply score the tile using one side of the pencil and snap it with the other side. You can use a hole saw to make circular cuts onto fragile tiles. These work on a wide variety of materials including metal and wood. All in all, the best tile saws will help you make the most precise cuts. Although all our top six choices are fantastic choices, we still have to choose one as the ultimate best! So, which is it? You guessed it! The DEWALT D24000S Heavy-Duty 10-inch Wet Tile Saw which is perfect for all kinds of applications. Its high-quality system allows you to make straight as well as bevel cuts. If you’re looking for a heavy-duty cutter, then the Dewalt 10-inch tile saw is perhaps the most suitable for you!